Natalie Aaron and Marla Schwartz are on Chick Lit Goddess? I can’t believe it either! 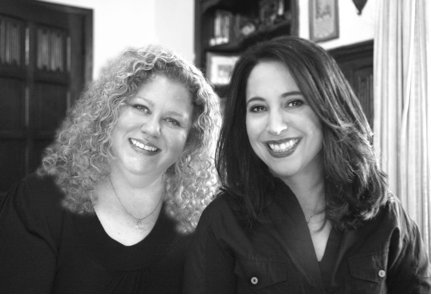 The two ladies have inspired and helped the genre of Chick Lit stay alive. It’s with their strong love and passion for all Chick Lit authors (new and upcoming), do these ladies make being a Chick Lit fan so much better. As the owner of Chick Lit Goddess, I’m honored to have them as guests! NATALIE AARON was born in Kansas, moved to L.A. and based solely on her astrological sign, was hired as a PA on commercials and music videos – only confirming what she’d heard about L.A. was true. Natalie went on to such critically acclaimed shows as Taxicab Confessions, Behind the Music and Movies That Shook the World, where she learned how to coax interviews from reluctant celebrities. Her recent producing credits include The Judds, Ruby, Sweet Home Alabama and Little People, Big World. Natalie lives in L.A. and hardly ever wonders how she wound up doing this for a living. How do you two write together? After some failed attempts, we figured out a system that worked really well for us. Over a period of three months we outlined every detail of the book – we mapped out every scene and every chapter. That way every creative decision was hashed out in advance. Then we’d go off and write on our own, email our finished work to each other and make notes on the page. We’d get together and go over notes and work the changes in together. It really streamlined the process. What do you love and hate about writing together? Love: Well besides the obvious advantages like brainstorming, cookie time and someone to take half of the work… it’s been great to have someone to share the ups and downs of this whole process with. Hate: We really don’t have a hate. We joke that Marla’s husband was the one who probably hated it – we spent a lot of weekends working! Have you two ever disagreed on where the story is going? Thankfully no. Because of the outlining – we were on the same page with all of the creative decisions. And luckily, we share the same sense of humor – that translated to one creative brain when it came to the writing. How long did it take you two to write Unscripted? That’s hard to say – we had a couple of false starts but when we finally buckled down and began outlining/writing it took around two years to get through two drafts. When her screenwriter ex makes a hit movie based on their relationship, Abby’s faults are projected on screens across the country. Suddenly the fact that her job depends on orchestrating hot tub hook-ups doesn’t seem so impressive. Her friends rally to help. Zoë thinks she needs to meet a guy. Stephanie suggests an attitude adjustment. Nancy wants her to get in touch with her inner Goddess. Abby knows they mean well, but she prefers to focus on her work. Unfortunately, she’s already embarrassed herself in front of her new boss, Will Harper, who she would find totally crush-worthy if he weren’t so irritating. How did you two celebrate the publication of the book? We were pretty nervous on release day and wanted to keep it low key so we had a little champagne toast and ordered in Indian food. Ebook or paperback? Ebook. There’s nothing better than downloading a book the instant you want it! Where do you see yourself in 5 years? 10 years? That question is always so hard to answer! All we know is that we hope we are happy, healthy and doing what we love for a living…writing! I just think it’s amazing that the two of you were able to write a book with one seamless voice! Bravo! I thoroughly enjoyed Unscripted and look forward to more from the two of you. I’m with Tracie – I loved Unscripted! Great answers to these questions. I’m really curious now who wrote what chapters!